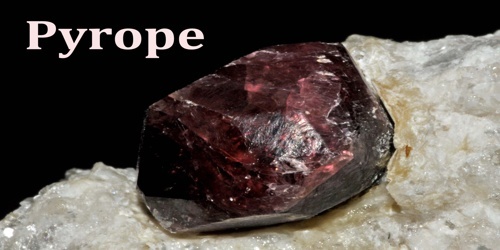 Pyrope is a deep yellowish-red garnet that consists of magnesium aluminium silicate and is used as a gemstone. It is a member of the Garnet group and its formula: Mg3Al2(SiO4)3. It is often free of flaws with good transparency, making it an important jewelry gemstone. Pyrope is much rarer than its Almandine counterpart, but it is generally more transparent and has less flaws than Almandine. A well-known environment of Pyrope is kimberlite pipes, where it can be associated together with Diamonds. The composition of pure pyrope is Mg3Al2(SiO4)3, although typically other elements are present in at least minor proportions these other elements include Ca, Cr, Fe and Mn. 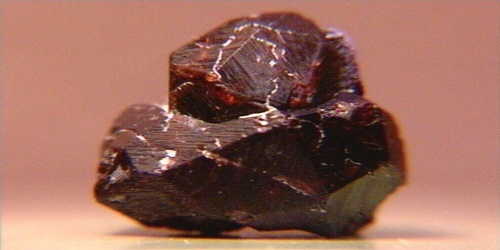 Pyrope forms a solid solution series with almandine and spessartine, which are collectively known as the pyralspite garnets (pyrope, almandine, spessartine). Iron and manganese substitute for the magnesium in the pyrope structure. The resultant, mixed composition garnets are defined according to their pyrope-almandine ratio. The semi-precious stone rhodolite is a garnet of ~70% pyrope composition. Pyrope is typically dark red to slightly brownish-red and is considered by some to be the reddest of all the garnets. It is the only member of the garnet family to always display red coloration and it is from this characteristic that it gets its name: from the Greek for fire and eye. Pyrope is an end-member of a solid solution garnet series with the other end member being alamandite. The chemical composition of Almandite is Fe3Al2(SiO4)3 while Pyrope´s composition is Mg3Al2(SiO4)3 so the only apparent difference is the presence of iron or magnesium. These garnets are gradational in composition and include varying percentages of iron and magnesium. Rhodolite is the mid member of this series and it contains both magnesium and iron. 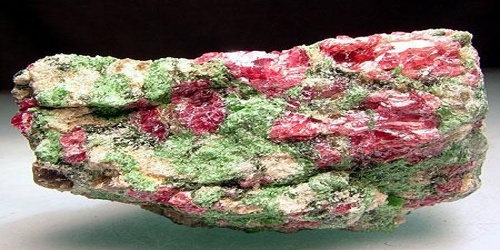 However, the red color is not only related to the basic chemistry and the position in the series, but also to trace amounts of chromium and even grossularite in some cases. Pyrope is very tricky to distinguish from almandine; however it is likely to display fewer flaws and inclusions. Other distinguishing criteria are listed in the adjacent table. Care should be taken when using these properties as many of those listed have been determined from synthetically grown, pure-composition pyrope. Garnet was much used as a jewel in ancient times. Anglo-Saxons made adornments of Garnet and gold to accompany them into the afterlife. Pyrope Garnet was considered effective against legendary vampires, and Pyrope bullets were once used in slings in parts of Asia. Bohemia is famous for its Pyrope Garnets, which can be as big as hens’ eggs and were made into lavish jewelry in the 18th and 19th centuries. It is common in peridotite xenoliths from kimberlite pipes, some of which are diamond-bearing. Pyrope found in association with diamond commonly has a Cr2O3 content of 3-8%, which imparts a distinctive violet to deep purple colouration and because of this is often used as a kimberlite indicator mineral in areas where erosive activity makes pin pointing the origin of the pipe difficult. 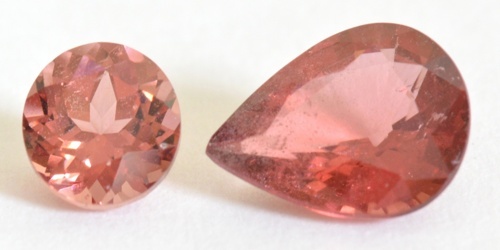 These varieties are known as chrome-pyrope, or G9/G10 garnets. Pyrope garnets are also sometimes associated with diamond deposits and it was the findings of pyrope on the surface of the Kalahari Desert and in the alluvial deposits of the Eastern Europe that led to important diamond discoveries in Namibia and Russia. There are no other deposits that have received much notoriety. As most of the pyrope deposits produce dark to over dark stones, there is little interest to extract them and unless some new source of large, beautiful and easy to reach stones become available the production of pyrope will remain limited.